If you've been struggling to create the sales copy you need to succeed in today’s competitive Internet marketplace, this is definitely the most important letter you will read today! In fact, right now, for a limited time, you can take advantage of a special promotional offer and receive the Simple Sales Copy software program for just $37 – that’s a full $110 off the regular price of $147! 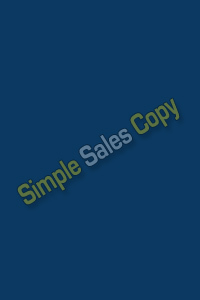 So go ahead and download your own copy of the Simple Sales Copy software program right now for only $37. That's an instant $110 discount. And, if you order today, we will include the NO RESTRICTION Private Label Rights to the SImple Sales Copy and include everything you need to sell this product from your web site and keep every penny for yourself! P.S Remember my special introductory offer won’t last long. 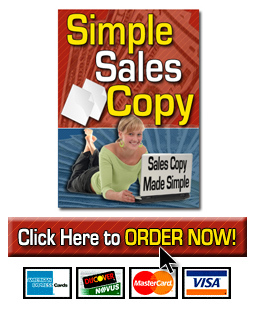 Receive the Simple Sales Copy software program for just $37 before it is too late!